Producers of low budget thrillers usually take one of two approaches to keep the bottom line slim: 1) Spend the money on cheap, gory scares; or 2) Establish a gimmick that keeps the story and action small. Pontypool takes the latter route, impressively adding one ingredient: intelligence. This frightening little Canadian chiller takes place in roughly one location, a makeshift radio studio set in the basement of an old church, where the Grant Mazzy morning show broadcasts to the people of Pontypool, Ontario. This particular morning, something seems to have Pontypudlians in its grasp -- and in true, low-budget form, we don't really get to see it. But through effective filmmaking, we do imagine it. Director Bruce McDonald (The Tracey Fragments) successfully relies on dramatic basics to set our minds ill-at-ease: competent acting, a comprehensive story, and a dedication to dialogue. 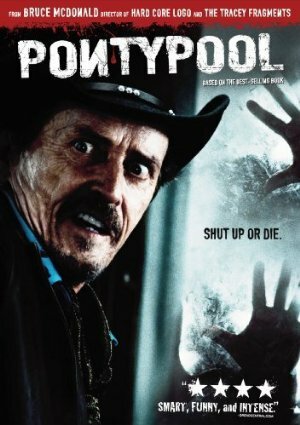 In fact, the script, adapated by first-timer Tony Burgess from his novel, is so focused on speech that language ends up playing a huge role as Pontypool develops. Getting into more detail would be spoiling too much. Although Pontypool spends most of its time underground, the film begins on the dark, open, freezing-cold road of mid-February Ontario. That's where we first meet Grant Mazzy (Stephen McHattie, A History of Violence) a grizzled, rebellious radio host who's busy firing his agent while driving to work. Before he can get to his destination, he comes across a woman standing in the snow, peering blankly into his car window and mumbling. Creepy. And easy to forget -- as McDonald spends the next 20 minutes detailing the intricacies of the radio show, with the interplay between Mazzy and his two female producers, the firm-handed Sydney (Lisa Houle, McHattie's real-life spouse) and young war veteran Laurel Ann (Georgina Reilly). With a smart variety of camera angles and moves, McDonald handily establishes character development and tension, not unlike Oliver Stone's handling of Talk Radio. A tweak of music here, a taste of a disagreement there, and we almost forget we're expecting a horror movie of some sort. Until word of strange happenings come into the station, of course. A mob scene outside a doctor's office, hordes of people sitting on a car. Chanting? Killing? There's no substantiation on any news wire, so no one at the station is sure what to believe. With a nice morsel of paranoia from McHattie, Grant begins to think the whole evolving story could be a giant B.S. scenario to make him look dumb. But McDonald slowly layers on more trouble, and the playful power of Pontypool comes when we can't determine whether the characters' isolation makes them snug as a bug or sitting ducks. After a local doctor conveniently enters the fray, the origin of the "disease" becomes apparent and the focus, oddly enough for a horror film, is about the impact of words, even specific language. Now that's unconventional. Aside from a slippery resolution -- one that may fall too far off the corny meter for some -- Pontypool elicits scares, discomfort and the occasional raised hairs. You know, all those feelings that tell you a smart, exciting movie is unspooling, that have you hanging on as you head for the final frames. How about a ponty ride?